The first section of the signs that the Emilia Romagna Region has financed for 2018, for the safety and facilitating the journey of pilgrims traveling through the Bidente Valley, has been completed. These loans were granted to the Union of Municipalities of the Romagna Forlivese, which by convention, has appointed our Association for the technical part. 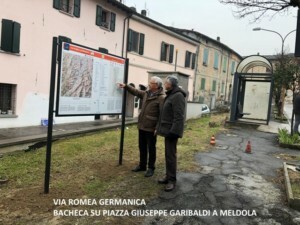 Indicator signs have been installed at Ronco di Forlì; in Meldola the first notice-board of the Via Romea Germanica was erected. The notice-board that was mounted in Piazza Garibaldi in Meldola is the first of the Via Romea Germanica, and is placed, like those that will come, at the entrance of the historic center, to give the traveler a sense of the path, of the location in which it is located , of the services to which he can draw. 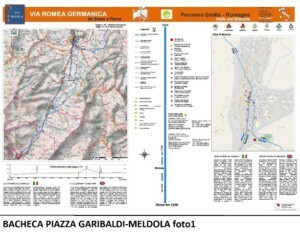 So the route between Meldola and Cusercoli is indicated; the same for the center of Meldola. There are also some notes on the city of Meldola, with its characteristics and points of greatest interest. With QRcode we can easily connect to the site of the Association, with additional information, useful for getting to know the city and its territory. 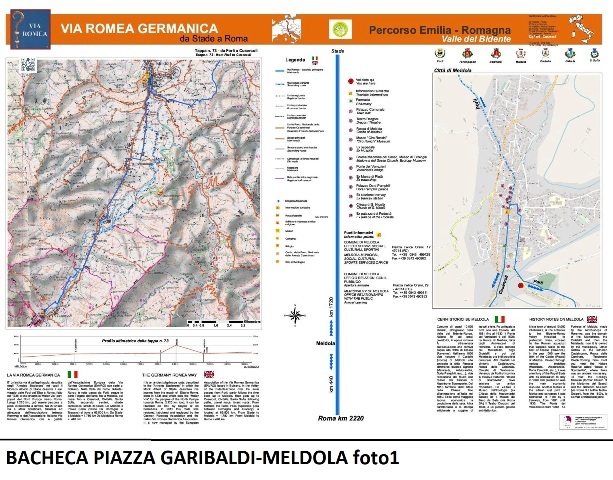 Another project is also under way to secure the route from Borgo Sisa to the center of Forlì, then to San Martino in Strada, through the Bosco di Scardavilla and then to Meldola. As soon as this path has been activated, which the Forlì Integrated Mobility Company is studying together with our Association Via Romea, a beautiful circuit of about 52 km will be created, which winds in exceptional environments, such as river banks, country roads and the first hills of the Apennine ridge. To be done by bike or on foot. In particular, the locality of Scardavilla, its former monastery and the Bosco will be enhanced; an area that is highly prized for its flora and fauna. This year 2019, other similar notice-boards will be designed and mounted: in Borgo Sisa, in Ronco Lido, in Cusercoli: this will facilitate dialogue and knowledge between local communities and tourists-guests.